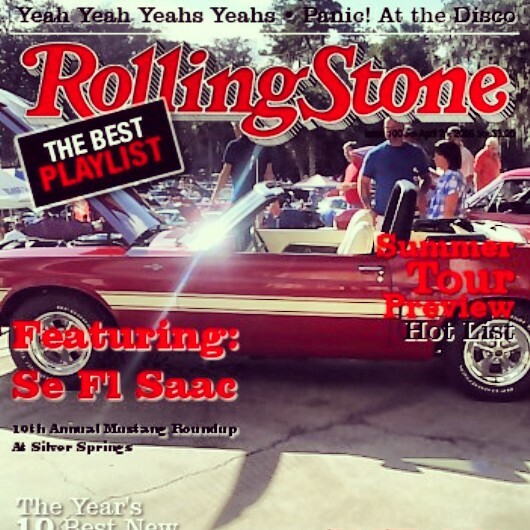 SE FL SAAC on the Cover of the Rolling Stones!!!??? Well not quite... Sorry, folks. We did not in fact make the cover of the Rolling Stones Magazine. (Mad editing props go out to our resident tech support, the Mach 1 Fashionista and Mr. T) However, we did make the June 2013 Muscle Mustangs & Fast Fords. They covered NPD's 19th Annual Ford & Mustang Roundup at Silvers Springs, Florida. Just above this picture they have a small picture. 3) Mr. Ciros white Cobra………………hissssssssss said the snake. Then if you have a HUBBLE TELESCOPE and you magnify this tiny picture, the building in the back you would see DARTHs BIG RED (a.k.a. El Gee Tee 500 Viejo). But through the miracle of the HUBBLE, we have magnified it for your viewing pleasure in picture number four. I guess it does not make sense to photograph two red Shelbys together. Oh well, maybe next year.